Whether you're inviting friends over for a game night or relaxing with a little down time by yourself, the Weave 36" Square Coffee Table in heritage brown with Umbrella Hole is designed to suit your outdoor patio needs. Constructed of rust resistant, maintenance free cast aluminum, this table's class cross weave patterned round top is as durable as it is timeless. 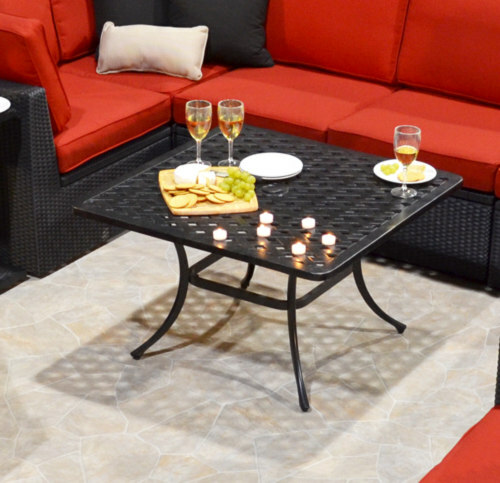 Able to complement any décor, the weave 36" cast aluminum square coffee table features an umbrella hole in the middle to give you the ability to add a patio umbrella so you can effortlessly bring shade to the party. Product Dimension: W36" x D36" x H" Shipping Dimension: 38" x 38" x 3"